Our staff aims to give you what we call a “Walt Disney experience” to ensure your satisfaction. “After being in practice for this long, I have more tools in my toolbox now than I did when I started.” Our clinic is equipped with the latest tools to assist with your chiropractic care. 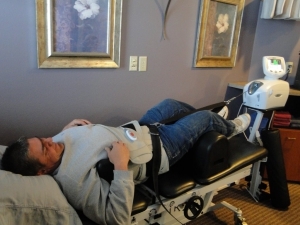 From your examination and evaluation all the way through your adjustments, Dr. Shawn uses a variety of tools and techniques. DOT Physical Certified. Dr. Shawn is a federal certified medical examiner for DOT physicals. Patient on our Spinal Decompression table. Nutritional Counseling. Input determines output. What you put into your body affects the way it performs. Our nutritional counselor is on hand to help you learn how your nutrition may be affecting your condition and what you can do to change it. Exercises. 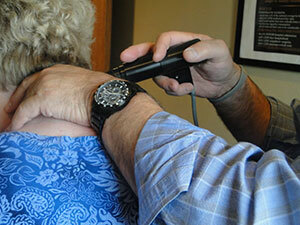 To ensure the lasting impact of your adjustment, sometimes you might be given some exercises to do at home. These exercises train the muscles to perform properly and help to keep joints in proper alignment.